Conceived in a flash of inspiration, thrown together in a slapdash manner under strict lyrical supervision, and met with near universal praise at the time of its release and then, sadly, quickly forgotten, Howe Gelb's 'Sno Angel Like You is one of the Aught's most unique, likeable, and least well-known albums, a joyous, unpretentious small-scale work possessed of tremendous charm and a striking musical and thematic cohesion that belies the haphazard way in which is was constructed. But to best understand this album, some back story is in order. Gelb...a Tuscon-based, veteran roots/garage rocker and founder of the vast, ever-changing musical collective Giant Sand....has been at it since the late 1970s, known primarily for his poetic lyricism, stylistic wanderlust, spontaneous live shows, and a loose (many would say sloppy) "leave the mistakes in" recording approach. He has never acheived much commercial success, but has had significant influence over the last twenty years. Several Giant Sand collaborators have gone on to form more celebrated bands of their own, most notably Joey Burns and John Convertino of Calexico, and younger roots-rockers such as M. Ward have openly acknowledge their indebtedness to Gelb's work. So, sometime in 2005, Gelb stumbled upon a live performance by the Canadian gospel act Voices Of Praise, and was immediately struck by the potential of pairing their soaring voices with his own limited, earthbound, Lou Reed-like talk/sing. When he asked the choir's director about the possibility of recording together, he was met with an enthusiastic "Sure!" followed by one caveat..."Just keep it positive." Given his marching orders, Gelb hurried to assemble material for the album lest his flash of inspiration fade, penning only seven original tracks for the album, then culling the rest from his own back catalog and that of his deceased friend and frequent collaborator, guitarist Rainer Ptacek. Drums, guitar beds, and Gelb's vocals were laid down quickly, and then the Voices Of Praise vocals were added just a few days later. A rushed, spotaneous process to be sure. But the end result was the best album of 2006. And one of the greatest pleasures of 'Sno Angel Like You is how well the songs, once sequenced, generate a sense of cohesion, narrative progression, and thematic intent, despite the ramshackle manner in which the they were assembled. Opening and closing with ruminations on death, the album plays as a wayward soul's slow conversion to a life of good christian living. Hardly a traditional theme for rock 'n' roll, antithetical really, and probably the main reason 'Sno Angel failed to end up on most 2006 year end lists, but to dismiss 'Sno Angel as corny or prosletyzing is a flat-out mistake. Gelb is far too sophisticated an artist for that (no matter how sloppy he allows himself to get), and truth be told, seems to have little interest in matters of pure faith. What Gelb is after is a celebration of the positive common sense life wisdom to be found buried behind the sermonizing in any Christian (or really any) religion. It starts with Get To Leave, an acoustic whisp of a track in which Gelb introduces himself as the world-weary, faithless cynic, a bone-tired elder who has come to reduce his life to an existence on a "planet made of rock, hard liquor, and discomfort," and despite "rumors of a better world once we get to leave," is really only enthusiastic about the "get to leave" part. Song two, Paradise Here Abouts, plays as if Gelb's character has accidentally stumbled into gospel celebration and is ecstatically welcomed with open arms. He's still not sold on any of this Christian life mumbo-jumbo, but the choir's enthusiasm is hard to resist, so he stays a while, and then the conversion begins. The rest of the 'Sno Angel's first half presents a spirited group of life lessons, covering the value of industriousness (Hey Man, That's How Things Get Done), the profound impact of parents (The Farm), the wisdom in avoiding temptation (But I Did Not), and the unlimited power of love (Love Has No Borders). After a blistering guitar interlude, the lessons seem to have sunk in, for the album's second half shifts from lectures to more personal expressions, embracing the joys of religious celebration for its sheer communal power (Robes of Bible Black), relying on principles to get through difficult challenges (Howlin' A Gale, Worried Spirits), and reducing life to its elemental essentials (the gorgeous Neon Filler). When the end finally comes for Gelb's character, in the stunning closing track, we find our narrator moments from death, no longer a cynic, but instead now looking back on his life as an all too brief Chore of Enchantment, hard for sure, but a gift to be celebrated, not a burden to be despised. His voice drifts off, a gentle choir of angels float in, and then oh so subtlely, it all just ends. Trust me on this one, readers, a more perfect ending to an album has not been crafted in the last ten years. And then there's the music, and its electrifying ugly/beautiful ascetic. Ironically, for all of 'Sno Angel's links to Christianity, and the instrumental adherence to country, gospel, and rock n' roll tropes, it is the Chinese ideal of yin yang that informs every moment of the album's construction. From Gelb's craggy, off-key, muttered vocals to Voices Of Praise's glorious explosions, from the songs's mesmerizing, flowing acoustic and slide guitar runs, to the vicious stratocaster stings that punctuate several numbers, 'Sno Angel Like You is an album constructed wholy out of the clash of opposites...and the design generates an unrelenting sense of musical dynamics that sustains interest from the album's opening moment to its last. Simply put, there isn't a bad moment on 'Sno Angel Like You. Though small in scale and approach, every song, with the possible exception of Love Has No Borders, is memorable. So don't let those forgetful critics and hipsters steer you wrong. Howe Gelb's 'Sno Angel Like You is one of the essential listens of the last decade. Cherry Picker's Best Bets: But I Did Not , The Farm , Howlin' A Gale , Chore Of Enchantment . Here's a scruffy live version of Robes Of Bible Black from a concert DVD featuring both Howe and Voices Of Praise. 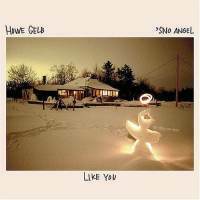 What are your thoughts on Howe Gelb's 'Sno Angel Like You? Let readers know.